Nuclear Pakistan: Hot-Headed or Rational? The essence of the Westphalian state system lies in the concept of territorial sovereignty. Inherent in the sanctity of the mainland is the need for national security. This has become an indispensable vital national interest of all states. The colossal damage caused by the atom bomb in Hiroshima and Nagasaki bears testimony to the annihilation capacity of Weapons of Mass Destruction (WMDs). However, there is a lot more to the use of the “deadly” nukes. The veritable value of going nuclear can be gauged in the hostile Indo-Pak theatre. The partition of the Indian Subcontinent saw the emergence of this intense rivalry from the very outset. The reasons are well documented and even a cursory look at them would enable students and observers to decipher the anatomy of adversarial ties. Both states grappled with their perceived and actual fears, and to withstand threats to their interests embroiled in armament, both conventional and nuclear. The need for treading on the nuclear path was different for both countries. It is imperative to briefly differentiate between the reasons for both South Asian titans going nuclear. India’s gargantuan foreign policy goals and security thinking shaped by long-held misgivings shaped her nuclear ambitions. Pakistan, on the other hand, faced with a quantitatively superior eastern neighbor, which was instrumental in its dismemberment, had to look for “internal balancing”. Indeed, the growing conventional asymmetry necessitated Islamabad to bear its own teeth. Pakistan was left with no choice but to induct a force equalizer to deter India from any military misadventure. Hence, Pakistan’s nuclear doctrine and the development of a cohesive nuclear force are intended to ward-off threats emanating from India. In all earnestness, Pakistan’s nuclear incursions are solely India centric. This assertion can be corroborated by the fact that Pakistan maintains the doctrine of Credible Minimum Deterrence (CMD). The idea behind CMD is that an enemy larger in size can be dissuaded with small but a credible nuclear force. The doctrine is well-suited to Pakistan’s evident limitations. Pakistan’s persistence with CMD has been effective in averting wars and also the “nuclear bogey” among other factors, ensured that low-intensity conflicts did not escalate into a full-scale war. The Kargil conflagration is perhaps a classic case of how the knowledge of the “nuclear possession” kept the conflict limited to a series of tactical skirmishes. Pessimists opine that deterrence theory failed when both locked horns over strategically vital peaks. However, it must be stressed that a 1965-like escalation was avoided, with the help of international intervention because both India and Pakistan had a nuclear device in their caches. Nuclear capabilities do not rule out the occurrence of low-intensity conflicts, for they bring about a stability-instability paradox, wherein things remain stable at the higher end of the conflict spectrum. One could argue that nuclear weapons provided both states with a cushion to wrest control of Kargil through tactical engagements, but it also acted as an equalizer, which baulked nefarious designs. During the whole episode, the nuclear umbrella gave Pakistan much-needed psychological security as she felt less vulnerable to a 1971-like Indian onslaught. The events of 1971 were monumental in shaping Pakistan’s nuclear campaign. International pressure prevailed on two other occasions. The first was in wake of Operation Parakram when after the parliament attacks, India amassed its forces on the International Border. Warmongering did not result in any physical engagement after the Mumbai attacks in 2008. The success of “Nuclear Pakistan” in preventing a full-scale war can be evidenced by the fact that the incendiary forces which caused previous wars and battles still persist. To-date there are opportunities akin to those present in 1971 for India to capitalize upon. Moreover, if accusations are to be believed there exists a pre-1965 war situation. Indeed, the possession of an assured nuclear capability has changed the type of threat emanating from the eastern flank. The ongoing non-kinetic war must and cannot be labelled as a failure of deterrence theory, for Pakistan’s nuclear posture is intended to make the pursuance of a military option untenable for India to use against Pakistan. Chief of Army Staff, General Qamar Javed Bajwa visited Strategic Plans Division today. He was received by Director General Strategic Plans Division, Lieutenant General Mazher Jamil and was given detailed briefing regarding various facets of Pakistan’s Strategic Programme. COAS underlined the centrality of Pakistan’s Strategic Programme against a specific threat to our security. COAS lauded the efforts of Scientists and Engineers involved in the development programmes, which made Pakistan’s defence formidable. He highly appreciated operational preparedness and training standards of the Strategic Forces. He particularly expressed satisfaction on the comprehensive security regime of SPD. Pakistan officially maintains that it does not aim to attain nuclear parity with India and will continue with the Minimum Credible Deterrence. Minimum is not a number but refers to the acquisition of no more nuclear weapons than necessary to deter the adversary from launching a nuclear attack. Thus the word “minimum” is relative at best and hence Pakistan has to monitor and evaluate the developments across the border. The question that one needs to answer is whether Pakistan’s increasing stockpile is a rational policy? Is there a need to bolster means of second-strike and inducting long-range ballistic missiles in the scheme of things? First, the development of a second-strike capability is central to deterrence. India, with a well developed second/counter strike capability and a greater geographical depth, had the propensity to withstand a surprise or a pre-emptive strike from Pakistan. However, Pakistan bereft of the very advantages would not have been able to thwart a retaliation. Thus, the addition of an assured second-strike capability is imperative to make deterrence credible. Second, the need for modernizing delivery systems is all the more important because of deterrence hooks upon the ability to make the enemy aware of the ability and the willingness to use the device if and when the need arises. Eyebrows have been raised regarding two aspects of Pakistan’s nuclear program. One is the growth in the number of warheads whilst the other is concerned with the design of Tactical Nuclear Weapons. As aforementioned, deterrence is more effective when a country has adequate second-strike prowess.The number game hence becomes all the more important especially given the threats posed to CMD by India’s ever-increasing economic and technological muscle. Second-strike elicits its strength of the “residual” capacity hence Pakistan can feel relatively safer by the mere accumulation of warheads before making them more credible. The quantum has gained currency especially after India’s deployment of the Ballistic Missile Defense System. Albeit in a rudimentary stage, the likelihood of intercepting Pakistan’s main delivery vehicles can greatly undermine the efficacy of Credible Minimum Deterrence. India’s BMD is likely to undermine Pakistan’s retaliatory capacity but a greater amount of warheads can reduce the precision of India’s Ballistic Missile Defense. In sum, India’s grandiose aspirations and the initiatives taken to augment her military muscle, coupled with Pakistan’s limitations necessitate the latter to add to its deterrence value. This is being rightly done by not only focusing on credibility and survivability but also on the quantum of warheads. This is in-line with Pakistan’s quest to provide for her own security in an environment dictated by anarchy and self-help. Perhaps, it is pertinent to quote Waltz once more amidst doubts about the perils of a “Nuclear Pakistan”. Pakistan Navy said on Thursday it conducted a successful test of a new land-based anti-ship missile, bolstering its operational reach to launch long- range, anti-ship missiles from land. The trial of the missile was conducted from the coastal region and the missile secured a hit on a target placed at sea, a press release from the Navy said. The missile is equipped with advanced technology and avionics, which enable engagement of targets at sea with a high degree of accuracy. However, the navy did not give more details, including the name of the new missile. The test-launch was witnessed by vice chief of naval staff Admiral Khan Hasham Bin Saddique and senior officers of Pakistan Navy. Admiral Saddique commended the accomplishment of the objectives of the trial, the release said. Chief of Naval Staff Admiral Muhammad Zakaullah in his message said that the weapon system has added a new dimension to the operational reach of Pakistan Navy, allowing it to bolster seaward defenses by giving the Navy the capability to launch long-range, anti-ship missiles from land. Pakistan on Tuesday conducted a successful test flight of the Ababeel surface-to-surface ballistic missile (SSM), the Inter-Services Public Relations (ISPR) said in a statement. 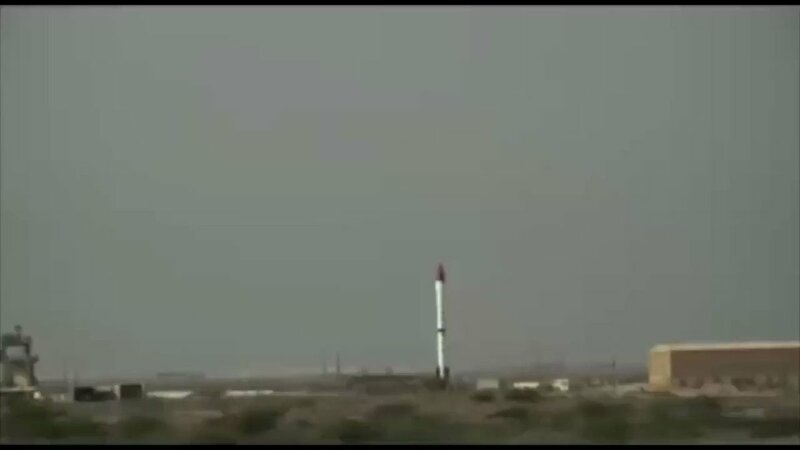 Pak successfully conducted first flight test of SSM #ABABEEL, Range 2200 Km. #COAS congrats team and Pak Armed Forces for landmk achievement. Ababeel has a maximum range of 2,200 kilometers and is capable of delivering multiple warheads using Multiple Independent Re-entry Vehicle (MIRV) technology, an ISPR press release added. “The test flight was aimed at validating the various design and technical parameters of the weapon system,” it said. Ababeel is capable of carrying nuclear warheads and has the capability to engage multiple targets with high precision, defeating hostile radars, the ISPR elaborated. “The development of the Ababeel weapon system was aimed at ensuring survivability of Pakistan’s ballistic missiles in the growing regional Ballistic Missile Defence (BMD) environment,” read the press release. The Ababeel test came on the heels of a successful test of submarine-launched cruise missile Babur-III earlier this month. 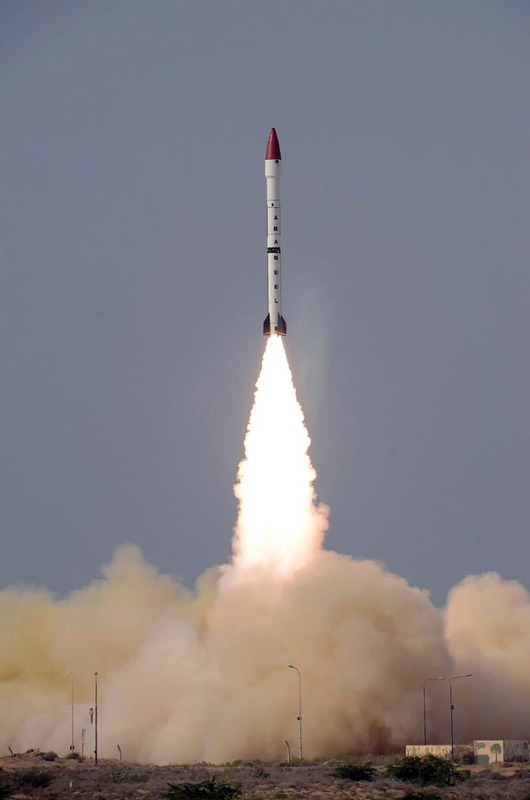 “The successful attainment of a second strike capability by Pakistan represents a major scientific milestone; it is a manifestation of the strategy of measured response to nuclear strategies and postures being adopted in Pakistan’s neighborhood,” the military had said after the Babur-III test. The missile, launched from an undisclosed location in the Indian Ocean from an underwater, mobile platform, had hit its target with precise accuracy, the Army had said. Babur-III is a sea-based variant of ground-launched cruise missile Babur-II, which was successfully tested in December last year. On January 24, Pakistan had test-fired 2,200-km range indigenously-developed surface to surface nuclear-capable missile Ababeel. The missile is capable of delivering multiple warheads, using Multiple Independent Re-entry Vehicle (MIRV) technologies. 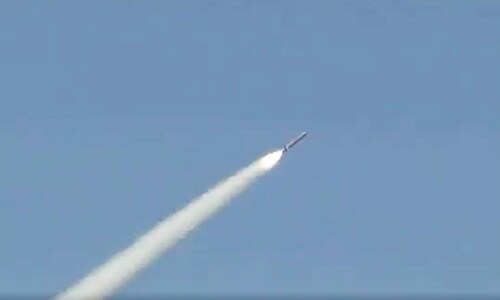 The Ababeel test flight was aimed at validating the various design and technical parameters of the weapon system. During the same month, submarine-launched cruise missile Babur-III was successfully test-fired. Babur weapons system incorporates advanced aerodynamics and avionics that can strike targets both at land and sea with high accuracy at a range of 700km. KARACHI: Naval platforms of nine participating countries arrived here Thursday to participate in Multinational Naval Exercise AMAN 2017 organized by Pakistan Navy. The exercise will be held from February 10-14. Over 36 countries are participating in the exercise, which will help in enhancing interoperability with regional and extra-regional navies thereby acting as a bridge between the regions. It will also project a positive image of Pakistan as a country contributing towards regional peace and stability, said a press released here Thursday. Being held since 2007, AMAN 17 is 5the edition of this series of Multinational Exercises. Upon arrival, the visiting ships were given a warm welcome by Senior Pakistan Navy Officials while catchy tunes of National Songs played by PN Band. Officials of the consulates of the respective countries also present in the reception. 1. USA Navy has participated in AMAN 09, AMAN 11 with naval assets and Special Operation Forces during AMAN 07. This year, USA Navy is participating with 04 Naval ships namely USS AMELIA EARHART, USCGS MAUI, USCGSAQUIDNEK and USS TYPHOON. 2. Chinese (PLA) Navy has been an active participant in all AMAN exercises. It has participated in AMAN 07, AMAN 11 and AMAN 13 with naval assets whereas in AMAN 09 it participated with Special Operation Forces team. In AMAN 17, Chinese Navy is participating with 03 ships namely HARBIN DDG 112, HANDAN FFG 575 and DONGPHINGU AO 960 with Senior Capt. Bai Yaoping it’s Mission Commander. 3. Russian Navy is participating in this series of exercises for the very first time with 03 ships namely SEVEROMORSK, ALTAY Tugboat, and DUBNA tanker. Its Special Operations, Forces are also part of this exercise. The Russian contingent’s mission commander is Capt. Stanislav R VARIK. 4. Japanese Navy is participating for the 4th time in this series of exercises with their 02 P3C Orian aircraft led by Commander Daigo Tsubokura. 5. Australian Navy is also participating for the 4th time in this exercise with naval assets. This year .its ship HMAS ARUNTA is arriving to participate in the exercise led by Commander Cameron Steil, Ran. 6. Indonesian Navy is participating in this series of exercises for the 2nd time. It has earlier participated in AMAN 09. Indonesian Navy ship KRI SULTAN ISKANDARMUDA is led by Commander Rio Henry Muko Yumm as its Mission Commander. 7. Turkish Navy has participated in previous exercises with their Special Operation Forces teams. Turkish Navy is taking part in the exercise for the first time with Ships. Turkish ship TCG GELIBOLU is commanded by Commander Ali Tuna Baysal. 8. Sri Lankan Navy is participating for the 2nd time with its assets. Earlier, they have participated in AMAN 13. Sri Lankan Navy Ship SLS SAMUDRA is commanded by Capt. JP Premaratne. 9. Royal British Navy has participated previously in AMAN 07, AMAN 09 and AMAN 13.This is their 4th participation in this series of exercises. HMS DARING will join the exercise this year commanded by Commander M J C Hember Mam. The Mission Commander from Royal British Navy is AVM Ed Stringer. During this exercise, participating units will rehearse various naval operations to enhance interoperability. The aim of this multinational ship’s exercise is to display united resolve against terrorism and crimes in the maritime domain. ‘Multi-mission missile boat to have latest weapons, sensors’ * Pakistan designs, constructs first-ever Fast Attack Craft-Missile at Karachi Shipyard KARACHI: The steel cutting ceremony of the fourth Fast Attack Craft (Missile) and two 32 x Tons Bollard Pull Tugs being built for the Pakistan Navy was held here at the Karachi Shipyard & Engineering Works. NESCOM Chairman Dr. Nabeel Hayat Malik was the chief guest on the occasion. The Fast Attack Craft (Missile) is a state of the art, multi-mission vessel, commonly known as the missile boat, designed by the Maritime Technologies Complex (MTC) and will have latest weapons and sensors. The first missile craft of this series PNS AZMAT was designed and constructed by the China Shipbuilding and Offshore International Corporation Ltd (CSOC) under a contract of the transfer of technology, and inducted in PN Fleet in June 2012. The second craft PNS DEHSHAT was indigenously-built at the Karachi Shipyard and commissioned in the Pakistan Navy in June 2014. The third fast attack craft has been launched in September this year and will be inducted in PN Fleet shortly. Addressing the ceremony, Dr. Nabeel Hayat Malik appreciated the accomplishment of these important milestones and urged each and every individual working in MTC and the Karachi Shipyard to put in the best towards the goal of indigenization of shipbuilding industry. He highlighted that KS&EW was consistently achieving major targets of its business plan and has become a role model for other public sector industries. He said that the indigenous design of the Fast Attack Craft (Missile) is a first step towards the goal of self-reliance in the ship design. He extended his gratitude to Chief of Naval Staff Admiral Muhammad Zakaullah for reposing confidence in KS&EW and MTC. In his welcome address, KS&EW Managing Director Rear Admiral Syed Hasan Nasir Shah said that the Fast Attack Craft (Missile) was the first-ever missile boat being designed and constructed in Pakistan. Realization of this project has put a huge responsibility on the Karachi Shipyard and MTC for its timely and successful completion. Giving a brief progress of ongoing projects, he highlighted that all out efforts would be made to deliver these projects on time with high quality. The ceremony was attended by a large number of guests from the government, the Pakistan Navy, NESCOM and the Karachi Shipyard & Engineering Works. Azmat Class Fast Attack Craft (Missile) are currently under construction for the Pakistan Navy. The first two boats were commissioned between 2012 and 2014, while the third vessel in class is expected to be commissioned in 2016. The fast attack craft can be deployed in maritime patrol, anti-surface warfare, anti-air warfare, search-and-rescue (SAR) and anti-piracy missions. The first fast attack craft, PNS Azmat (1013), was jointly developed by China Shipbuilding and Offshore Company (CSOC) and Xingang Shipyard. It was launched in September 2011 and commissioned into service in April 2012. The Pakistan Navy entered a transfer of technology (ToT) agreement with CSOC and Xingang Shipyard to build two more vessels at Karachi Shipyard & Engineering Works (KS&EW). The second vessel in class, PNS Dehshat (1014), was launched in August 2012 and inducted into service in June 2014. The first steel was cut for the third missile craft in April 2015 and her keel was laid down at KS&EW in August 2015, while delivery is scheduled for 2016. The state-of-the-art vessel incorporates a steel hull, and a super structure made of aluminium. Built according to the China Classification Society (CSS) rules and guidelines, each ship features stealthier design integrating modern missile and combat systems, as well as surface search and tracking radars. The fast attack craft measures 63m-long and 8.8m-wide, and has a design draught of 2.46m and displacement of 560t. The Azmat class vessels lack aircraft handling facilities due to their compact dimensions. Each ship can complement a crew of 12 to 14. Fitted with a 25mm automatic gun as the main rifle, the Azmat class is also armed with an AK-630 close-in weapon system (CIWS) to protect the ship from incoming anti-ship missiles and other precision guided weapons. The AK-630 CIWS is guided by radar and TV-optical detection and tracking system. The fully-automated gun mount can be remotely-operated from either the control cabinet or using a remotely-located gun-sight. The CIWS offers a rate of fire of 4,000 to 10,000 rounds a minute and can engage targets within the range of 5,000m. The vessel is also installed with two batches of tube launchers for firing decoys / chaffs. The Azmat class is installed with two quadruple missile launchers to fire eight C-802 anti ship cruise missiles. The C-802 is an extended-range export variant of the Chinese-built YJ-8 anti-ship missile. The missile is capable of carrying a 165kg time-delayed, semi-armour-piercing, high-explosive warhead. It has a maximum range of 120km and can travel at a speed of Mach 0.9. The C-802 missile is equipped with inertial and terminal active radar guidance system. Each Azmat class fast attack missile craft is powered by four diesel engines driving four fixed pitch propellers (FPPs) through a pair of two propulsion shafts. The propulsion system provides high manoeuvrability to the vessel during high-intensity missions. The ship has a maximum speed of 30kt and can attain a range of 1,000 nmi. NEW DELHI — The Indian army reportedly plans to import missiles from abroad rather than continue buying a less-advanced locally developed system, prioritizing combat capabilities over government efforts to promote domestic manufacturing. “There were technical, research-oriented issues” with India’s Akash system, a Ministry of Defense official told the Nikkei Asian Review. The military has finished testing Israeli, Russian and Swedish alternatives, with Israel’s Spyder in the lead, the official said. The ministry’s Defense Research and Development Organization had worked on the Akash surface-to-air missile system for around three decades, intending to supply the army, navy and air force. The army has ordered two regiments’ worth, and the air force has ordered 15 squadrons’ worth, for a total of 250 billion rupees ($3.75 billion). The army had been expected to buy more, as it needs to deploy six missile regiments along the borders with Pakistan and China. The Akash has a range of 25km. The army has informed the R&D agency that it will not order any more Akash systems, a source said. The Akash requires eight to nine seconds to fire, compared with just four to five seconds for the Spyder, making the homegrown system more likely to fail to intercept targets in border areas where response time is limited. Its lack of the latest guidance technology was apparently also a concern to the army. Contract negotiations with Israel “will be started sometime later,” a ministry official said. The military expects to negotiate the price of the Spyder down to a level on a par with the Akash. The Akash’s technical weaknesses owe to more than a decade of development delays. The navy has avoided the Akash, citing stabilization problems, and the air force is unlikely to put in any more orders. Security analyst Rajeev Sharma argued that the capabilities of the R&D agency, which is tasked with developing more sophisticated military technology, are lacking. The Akash is “meeting the same fate as Arjun,” the indigenous tank developed by the DRDO over 20 years, “which has no more buyers now due to its weaker features,” Sharma said. The government replaced the agency’s head last year. 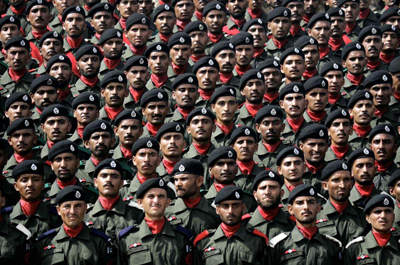 Pakistan and China, which have locked horns with India in South Asia for years, have been building up their militaries. Pakistan is strengthening its aerial forces, marketing the JF-17 fighter jointly developed with China to Asian countries including Myanmar and Sri Lanka while seeking to buy F-16 jets built by American defense contractor Lockheed Martin.